These images where taken by my fellow operator, Roger Jenner, on his phone, so quality might not be best. I knew I could do it Roger! More details of layout to follow, hopefully. Gnice to see pictures of your layout at last Jack. I think it's great that you've built your sense of humour into it. However, it's still portrays a realistic scene. Gnood to see you managed to post some pictures of Oak End Farm Jack, well done. 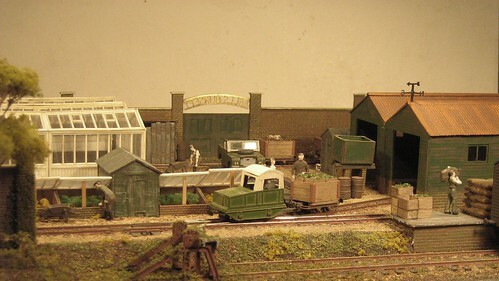 Oak end Farm was built to depict a very narrow gauge railway used to transport produce from the fields to a packing/processing shed, the big red corrugated building, and packed produce taken away, plus general carrier around the farm. The layout measures 39 inches by 19 inches, all track used is Peco 009, points are operated by wire in tube and are operated by DPDT switches to change the frog polarity. The track is a continuous circuit with a loop at the rear for the fiddle yard, a passing loop at the right hand front, a siding along the front of the shed, and a siding leading into the shed, where full loads are changed for empties. There is a door on the side of the shed which is operated from the back via a system of levers and links. The shed uses corrugated cardboard from old boxes, and balsa, on a foamboard frame, fences are stained balsa and some coffee stirrers. Scenery and vegetation is from hanging basket liner, card punch leaves and flowers, plus pound shop plants meant for tropical fish tanks for the taller flowers and plants. Locos and rolling stock are mainly from styrene sheet and sections, plus brass wire and tube etc, fitted onto proprietary chassis and mechanisms. The Land Rover is made out of styrene for the body, wood for the chassis and modelling clay for the wheels, the wheels where made for me by Ian Roberts. More pictures from Roger Jenner. Very impressive work, Jack ... I really do like it, and it has great potential for operation and 'play'. You scratchbuilt the Landy? I would have guessed it was a kit ... yet another feather for your cap! Yes the Land Rover is scratch built as I could not find a suitable kit. I wanted a series '1' 80inch wheelbase, as it was what my Grandfather used to drive back in 1950/1960. The tilt is made from a large envelope, matt varnished, the Land Rover carries the number plate from my Grandfather's, but is a bit small so I shall have to try and get a bigger one. Some more pictures, these where taken by Henderson McEwan at the Sussex Downs 009 Group open day. Wow. Fantastic layout. Lots of great details everywhere. Thanks for posting the photos. Thank you gentlemen for your kind comments. As you know we like to portray a sense of humour in the layout also in the operation, after all it is a hobby and they are meant to be enjoyable. Yes that loco was inspired by the Sylvasprings one, though of a different gauge. I have also built another loco based on an earlier design from the same railway, photos later on. By the way the layout has been invited to ExpoNG at Swanley this year so hope to see some of you there. I know you like to scratch build everything yourself (very commendable) but with regards to the No plates on the 'Landy" which you do not appear to be happy with have you considered a custom etching from 'Narrow Planet '? I can highly recommend their quality and service as you know. It's funny you should mention Narrow Planet for the number plates, I have been thinking about them for the plates over the weekend,--- Great minds and all that. 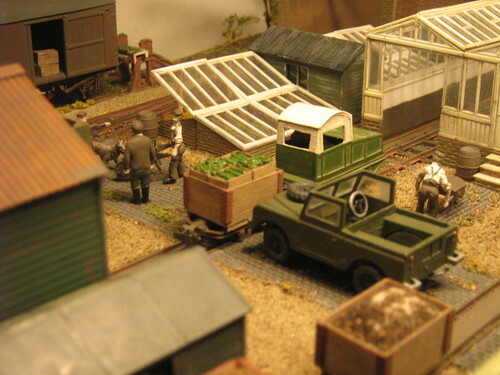 There is a GN15 layout called Balnakeil, that features on these pages, that sometimes has a series '1' and at other times a light weight Land Rover, so if you have been visiting exhibitions in the Kent and Sussex area you will probably have come across it. Have you considered replacing the left third with an annex, using different building materials and roofline? Jack, I hope you don't mind me hijacking your thread but I thought you might like to see my 009 versions of the Silvasprings loco and 4mm landrover. The loco is scratch built in plasticard and the Landie is a long wheel base Airfix kit, cut down to a short wheelbase to fit in the available space. The layout, Wills Walled Nursery was built as an Expong competition entry. It featured a sliding traverser, in the greenhouse, a quadrant sector plate in the shed and a single turnout. It was inspired by the Walled Nursery in Kent whcih once supplied produce for what is now a private school. It was at one time owned by Charles Eugene Gunther whos company made Oxo. Thanks for your comments, I have no plans to alter the basic layout at this time. The barn was designed to dominate the scene, it probably does not look so dominate in the flesh though. I remember seeing Wills Walled Nursery in the NG&IRM Review of April 2007, also in the same issue was Purespring Watercress by Ian Holmes. Both layouts featured the loco and Ian's also featured the earlier loco, which I have used as a basis for another loco. I am sure that both these layouts had an influence on the design of Oak End. I have admired both these layouts for a long time, I especially like the use of the Wills products you have used in the design of the layout. These images where taken by my fellow operator, Roger Jenner, on his phone, so quality might not be best. I'm very much enjoying this Jack. Andrew Neale (the railway publisher - Plateway Press - and railway bookseller) has some 12" to the foot 15" gauge rolling which has been inspired by 1/12 scale modelling. The same sort of thinking works for me too, so I'm always looking for ideas from Gnine that I might adapt to my 7 1/4" Tramway. To that end do you have a closish shot of the loco that features in the above pic just above the word 'best' please? Unfortunately you have seen most of the photos I have at the present, apart from some more of the Land Rover, which you most likely have seen enough of, so I will try to get more photos featuring the rolling stock etc. 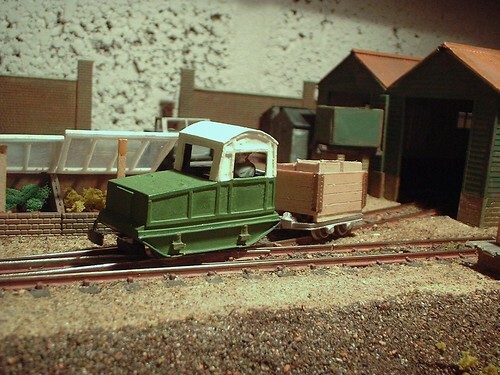 The loco you ask about is based on one at the Perrygrove Railway, it is called Workhorse and was featured in the GN15 Tome issue 4 of March 2007, it is a Simplex and I have modelled it minus the roof the prototype carries. It is built from my usual medium, plasticard, with wire and tube for details, it originally used a Carmel chassis for it's motive power, but that did not appear to be too successful, so it now runs on a power bogie from a Green Max dmu chassis that must be getting on for 18 or 20 years old, it still runs okay, but is a little noisy. Cheers Jack, I thought it might be that. I'm quite a fan of Workhorse, but it's supposed to be a bit of a pig to drive. Some photos of Oak End locos and rolling stock. These locos are based on the two from Sylvasprings watercress railway of Bere Regis Dorset. This loco is based on a mixture of Lister and O&K, rolling stock is freelance. My first Gnine loco building attempt, a Lister look a like, with Arnie at the controls. Apologies that the photos are not the greatest quality, I blame the camera! Cracking stuff Jack, the Watercress locos look especially special! Thank you demaine 22 for your comments. Following the theme from a couple of threads on this forum we decided to build a rivet train for the counters. This is all done tongue in cheek as we can still admire fine scale modellers work even if our own efforts some times do not attract a second or even a first glance. Any way featured is our rivet train with Workhorse look a like in charge making it's way round bee hive curve.